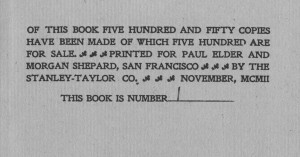 In publishing, a colophon is a brief description of a book’s production or publication details. 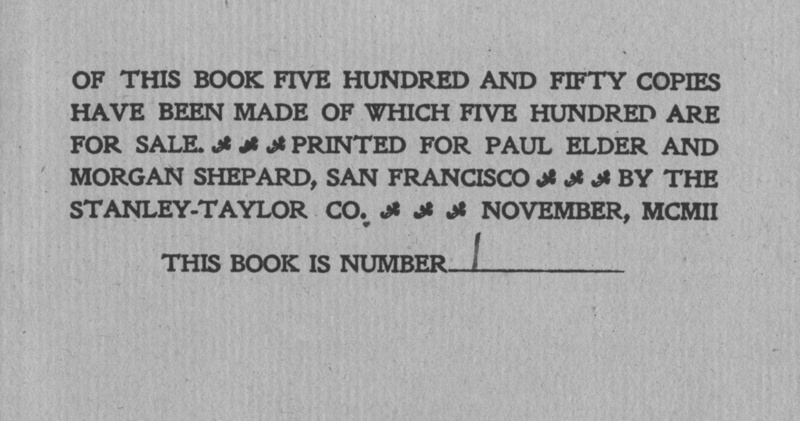 In modern American books, the colophon has been subsumed into the copyright details, which are almost always placed on the title page verso, but European books sometimes place the colophon at the end of the book. 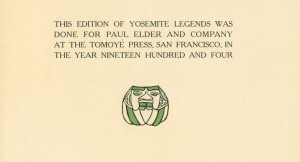 Elder’s style was to put the copyright information on the title page verso, and the colophon after the last page of text. 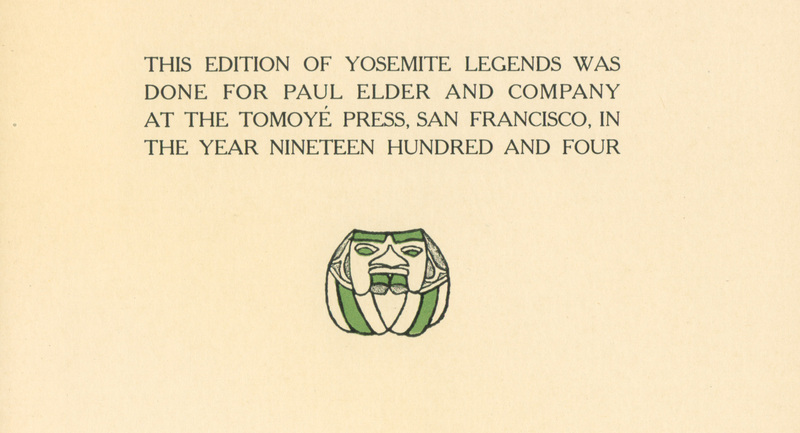 Today, fine press books also often follow this practice. 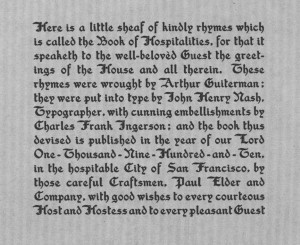 The Latin word colophon comes from the Greek κολοφων meaning “summit,” or “finishing.” The term originally applied to inscriptions appended to the end of ancient Near East texts written on clay tablets. 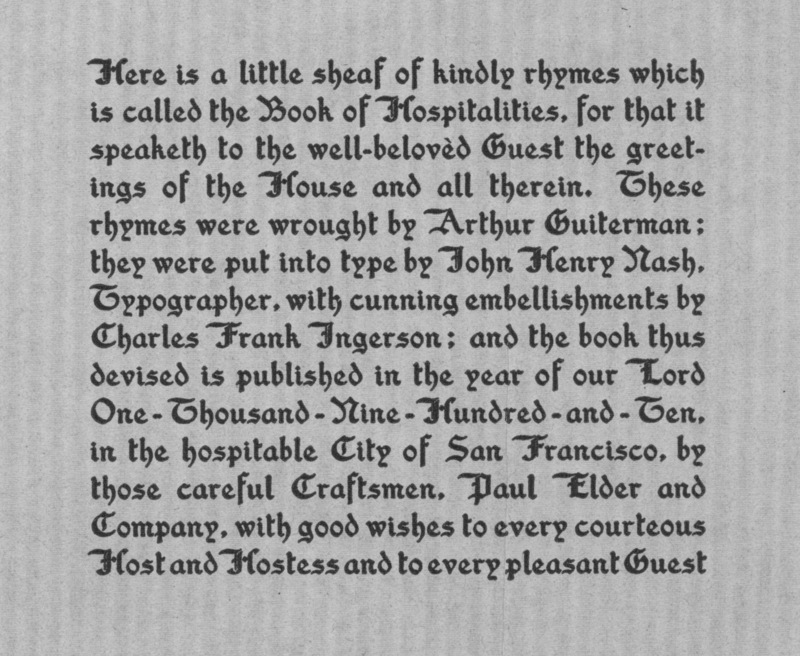 The colophon would contain such facts as the scribe, the owner, the literary contents and occasionally the reason for writing. For example, the Masoretic text of the Hebrew Bible contains colophons at the end of every book, noting, among other things, how many verses the book contains. 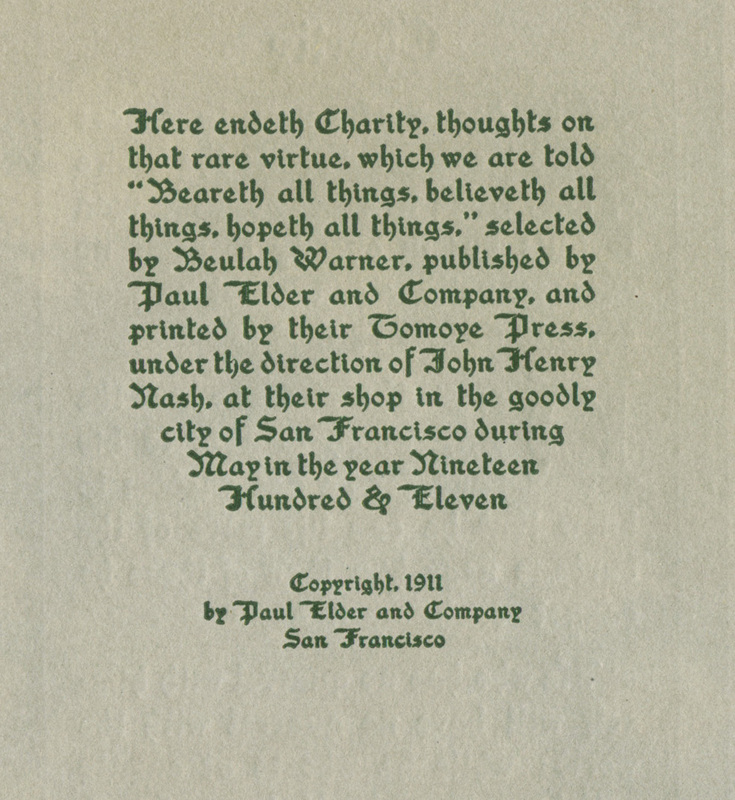 Most, but not all, Paul Elder publications after 1902 contain a colophon. 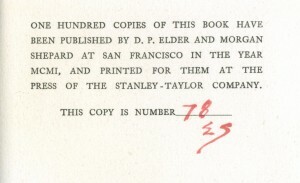 The usual formula is the title, author, printer, month and date of publication. 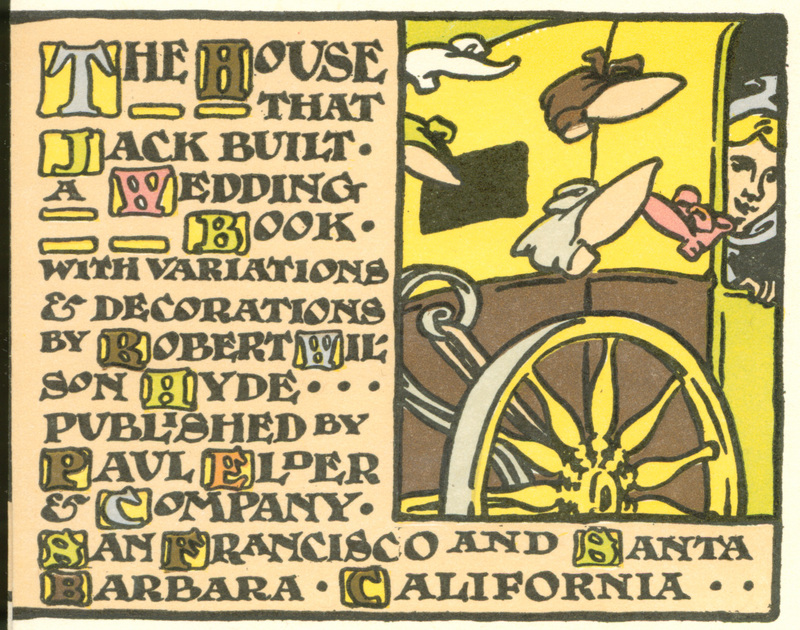 Most colophons were written out in full sentences, stylistically matching the tone and content of the book. 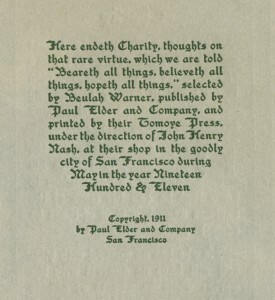 Since Elder’s colophons nearly always mention the printer, they are particularly useful in pinning down when each man joined and left the Tomoye Press’s employ. 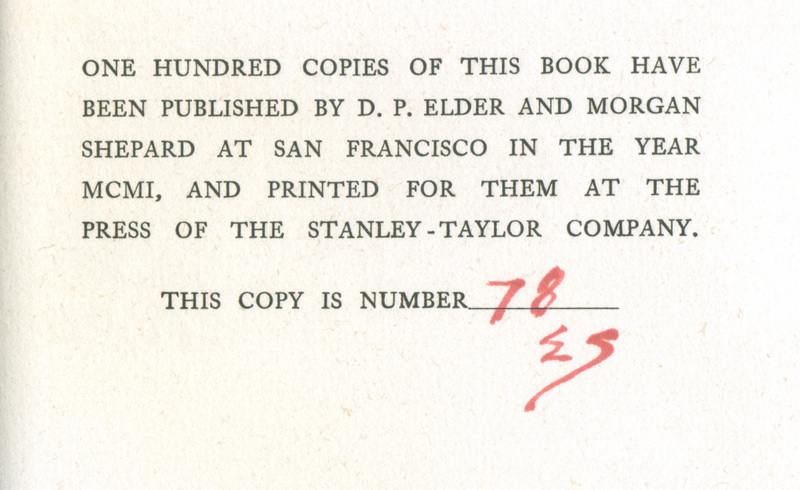 John Henry Nash, the most famous of Elder’s printers, left the company acrimoniously in late 1911. 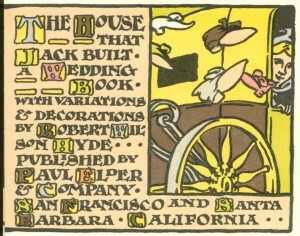 Colophon of “The Standard Upheld,” by Morgan Shepard, 1902. Copy #1 of 500.